Lineage. Constituted 100th Pursuit Squadron on 27 Dec 1941. Activated on 19 Feb 1942. 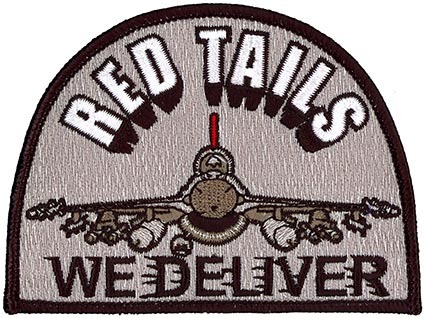 Redesignated 100th Fighter Squadron on 15 May 1942. Inactivated on 19 Oct 1945. Activated on 1 Jul 1947. Inactivated on 1 Jul 1949. Redesignated 100th Air Refueling Squadron on 1 Jan 1953. Activated on 23 May 1953. Inactivated on 24 Nov 1953. Reactivated on 8 Sep 1954. Inactivated on 25 Jun 1966. Redesignated as 100th Flying Training Squadron on 1 Sep 1989. Activated in the reserve on 1 Sep 1989. Inactivated on 1 Apr 1993. Redesignated 100th Expeditionary Air Refueling Squadron and converted to provisional status on 9 Apr 1999. Activated on 9 Apr 1999. Inactivated on 20 Jun 1999. Reactivated as 100th Flying Training Squadron and converted to regular status on 1 Jul 1999. Inactivated on 12 Sep 2007. Allocated to the Alabama Air National Guard on 13 Sep 2007-. ANG: 160th Fighter Squadron extended Federal recognition on 1 Oct 1947. Redesignated 160th Tactical Reconnaissance Squadron in Nov 1950; 160th Tactical Reconnaissance Squadron (Photo Jet) in Jul 1951; 160th Tactical Fighter Squadron on 1 Jul 1983; 160th Fighter Squadron on 15 Mar 1992; 100th Fighter Squadron on 13 Sep 2007-. Assignments. Southeast Air Corps (later Army Air Forces) Training Center, 19 Feb 1942; Third Air Force, 4 Jul 1942; 332d Fighter Group, 13 Oct 1942-19 Oct 1945; 1 Jul 1947-1 Jul 1949. Second Air Force, 23 May-24 November 1953; Fourteenth Air Force, 8 Sep 1954; (Attached to: 19th Bombardment Wing, 2 Feb-16 Aug 1956); 100th Bombardment Wing, 16 August 1956-25 June 1966. 82d 82d Operations Group, 1 Sep 1989-1 Apr 1993. 100th Expeditionary Operations Group, 9 Apr-20 Jun 1999. 340th Flying Training Group, 1 Jul 1999-12 Sep 2007; Allocated to ANG , 13 Sep 2007-. ANG. 187th Tactical Reconnaissance Group, 15 Oct 1962; 187th Tactical Fighter Group, 1 Jul 1983; 187th Fighter Group, 15 Mar 1992; 187th Fighter Wing, Oct 1995-. Stations. Tuskegee, AL, 19 Feb 1942; Selfridge Field, MI, 29 Mar 1943; Oscoda AAF, FL, 29 Oct 1943; Selfridge Field, MI, 8 Nov-22 Dec 1943; Montecorvino, Italy, 3 Feb 1944; Capodichino, Italy, 21 Feb 1944; Ramitelli AF, Italy, 6 Jun 1944; Cattolica, Italy, c. 4 May 1945; Lucerna, Italy, c. 18 Jul-Sep 1945; Camp Kilmer, NJ, 17-19 Oct 1945. Lockbourne AFB, OH, 1 Jul 1947-1 Jul 1949. Lockbourne AFB, OH, 23 May 1953-24 Nov 1953. Robins AFB, GA, 8 Sep 1954; Pease AFB, NH, Aug 1956-25 Jun 1966. Williams Air Force Base, AZ, 1 Sep 1989- 1 Apr 1993. RAF Mildenhall, England, 9 Apr 1999-20 Jun 1999. Randolph AFB, TX, 1 Jul 1999- 12 Sep 2007-. Aircraft. P-39, 1943, 1944; P-40, 1943; P-47, 1944, 1947-1949; P-51, 1944-1945. KB-29, 1953; KC-97, 1954-1966. KC-135, 1999. T-38, 1999-2007; T-1, 1999-2007; T-6, 2000-2007. ANG. P-51D, 1947-1950; RF-51D, 1950-1951, 1953-1955; RF-80A, 1951-1953, 1955-1956; RF-84F, 1956-1971; RF-4C, 1971-1983; F-4D, 1983-1988; F-16, 1988-. Operations. Korean War call-up, 1950-1953. Berlin Crisis call-up, 1961-1962. Tactical Reconnaissance Mission 1950-1983. Multi-purpose fighter role, 1983-Present. Won Photo Finish 1981: ANG Fangsmoke competition in 1987. Participated in Operation Provide Comfort in 1995. Operation Southern Watch in 1996, Operation Northern Watch in 1997 to enforce the respective northern and southern no-fly zones over Iraq. Combat Air Patrol missions in the southeastern US in support of Operation Noble Eagle for one year following the events of September 11. Operation Iraqi Freedom, 2003, 2004. Campaign Streamers. Rome-Arno; Normandy; Northern France; Southern France; North Apennines; Rhineland; Central Europe; Po Valley; Air Combat, EAME Theater. Decorations. Distinguished Unit Citation: Germany, 24 Mar 1945. Emblem. Approved 25 Nov 1944.